ISBN 0634016741. 9x12 inches. Arranged by Bobby Joe Holman. 19 songs from the silver screen, arranged for diatonic and chromatic harmonica. Includes: Alfie • Bless the Beasts and Children • Chim Chim Cher-ee • The Entertainer • Georgy Girl • Midnight Cowboy • Moon River • Picnic • Speak Softly, Love • Stormy Weather • Tenderly • Unchained Melody • What a Wonderful World • and more, plus a guide to harmonica tablature. Perfect for use with the Hal Leonard Harmonica Method! movie themes to my list of personal favorites. I am really pleased with this resource and will look for more straight harmonica music in the future. 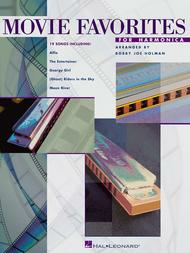 Is the best collection of film music for chromatic harmonica. I've bought it only to play Midnite cowboy and wonderful world like Jean Jacques Milteau on stage! It's easy to play and it's very good to get better, believe me!